MISSION: To have fun, and at the same time help others, who need our expertise and knitted breast prostheses. Knitters located in the Quad Cities area (Illinois/Iowa cities of Rock Island, Moline, Davenport, and Bettendorf) are creating breast prostheses and giving them away for FREE! 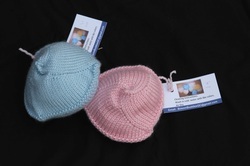 Check the instructions page to knit or crochet your own or donate to others who need them. Contact us if you need some and don’t have access to anyone who knits or crochets. The group meets every Wednesday from 1:15 pm to 3:15 pm at the Unity Point Trinity Hospital--Moline Cafe (John Deere Road & 7th Street in Moline, Illinois). New members are always welcomed. If you want to get a personal fitting for a Bosom Buddies breast prosthesis, bring a bra to use for sizing. Or you can contact us via email using the Contact page to arrange a fitting. The group provides samples to QC area surgeon, oncology, and general practice offices, Gilda’s Club Quad Cities, QC area Cancer Survivors Groups, the Rock Island County American Cancer Society office, Hammond Henry Rehab Department in Geneseo, IL and Trinity Women’s Imaging in Moline, IL. We will work with any interested medical entities in the QC area to supply them upon receiving a request from them.